Although I worked across the Columbia River in Vancouver for many years, I don't get up there all that often these days. 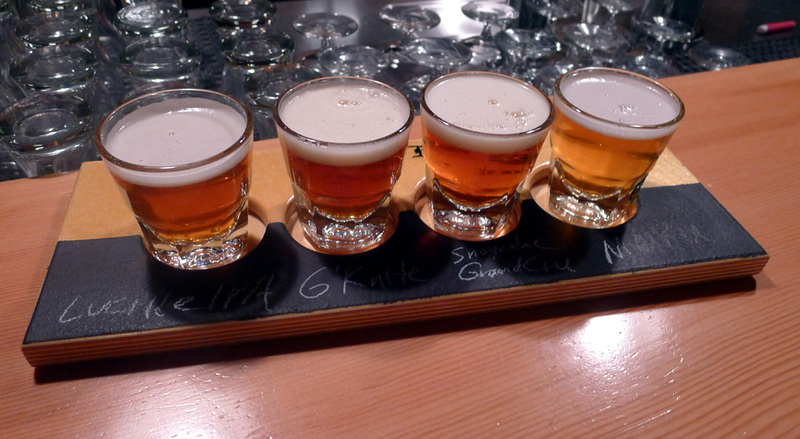 The beer culture there isn't nearly as wealthy as it is in Portland. However, things are changing. The Couv is moving on up. An evening meeting with a guy I once worked with gave me an opening to check out By the Bottle, a shop in downtown Vancouver. This place has been in business as a bottle shop for something like six years. They added a taproom more recently and it fits in well with the mission here. First, the taproom. It's situated up a small flight of stairs and behind the main shop. There are nine taps. 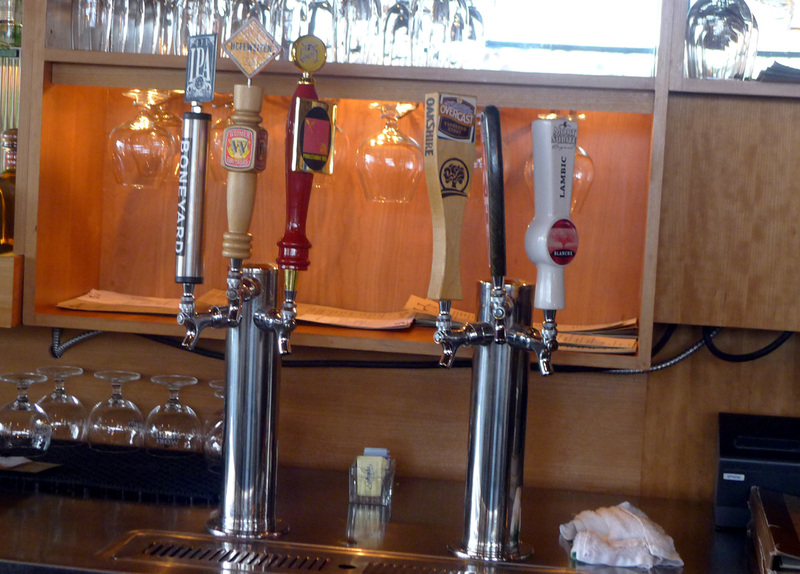 Eight of those taps pour a rotating selection of fine beers, including some that are not available across the river in Portland. One tap (big pink elephant) is dedicated to a Belgian beer. The taproom is cash only. 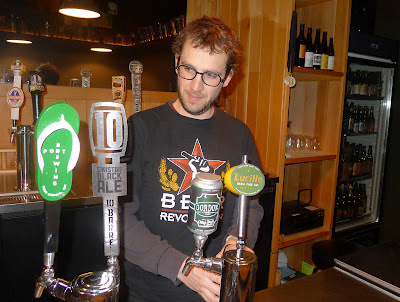 A significantly important feature of the taproom on my visit was the barkeep, Angelo DeIeso. Angelo is the founder of Brewpublic, one of Portland's most active beer blogs. His knowledge of beer runs deep and he's good at sharing what he knows with patrons. There's no point spending much time talking about the available beers because they are ever-changing. My favorite was Mongo Double IPA from Port Brewing in San Marcos, Calif. This beer apparently isn't available in Oregon. It's terrific. Most of the beers I tasted came from Washington and Oregon, but you never know what you'll find. There's a tap list section on the By the Bottle website...I'm not sure how often it gets updated. As for the bottle shop, it's packed with great beer. Angelo said they have around 600 different beers in there. They come from all over the world. One of things they do at By the Bottle is keep the bulk of their inventory cold. They also do their best to protect beer from UV rays...light being one of the worst enemies of beer. All windows and lights in the store have UV filters. It's all about keeping the beer as fresh as possible. By the Bottle is a great spot and a nice example of how the beer culture in Vancouver is evolving. Once considered a laughing stock and backwater, the Couv has made huge strides. Mt. 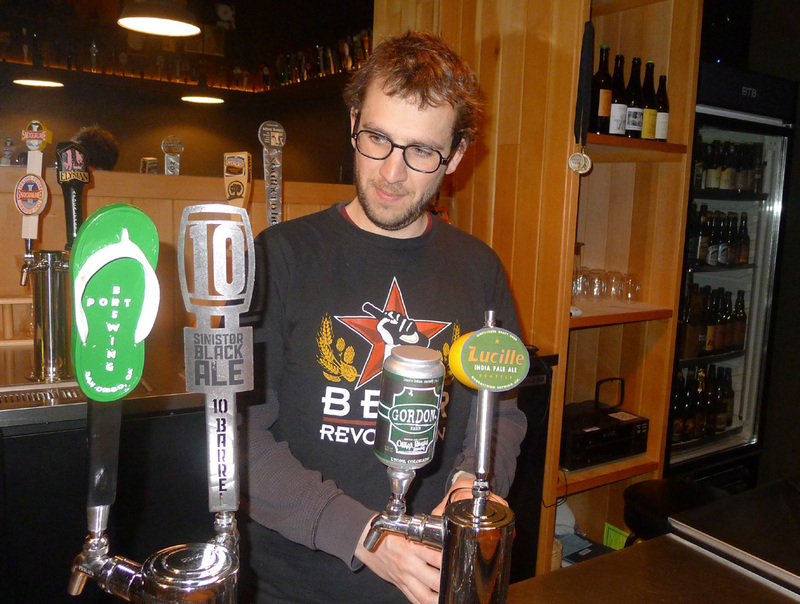 Tabor Brewing and Salmon Creek Brewing, like By the Bottle, are both in the downtown area. That's not all. There are more beer destinations not far from downtown. McMenamin's on the Columbia and Beaches come to mind. Yesterdays excursion took me to Lapellah, a restaurant and bar located in Grand Central Mall east of downtown. This place is operated by the same folks who run Roots Restaurant and Bar and 360 Pizzeria in Camas. These places are all marginally upscale. Lapellah isn't nominally a destination for craft beer fans. But it isn't bad. They've got six taps, as well as a selection of bottles. They had Widmer Hefeweizen, Oakshire Espresso Stout and Lompoc Proletariat Red on tap. The big surprise was finding Boneyard RPM IPA on the tap list. I know some people who feverishly search for this beer around town. Lapellah apparently has it on often. Who knew? Thanks for the writeup, Pete! About Lapellah, who knew indeed? I've been there, but didn't realize they had great beers. We haven't been back, but it looks like it's time to try it again. Also on the route I'll check out By The Bottle again. Time to get out into my own backyard. Thanks for the interesting post. Lapellah doesn't have a huge selection. But what they have is mostly good. In the old days, two of those taps would have been occupied by Bud and Bud Light. Times are a changin'. If you stop in at By the Bottle, hopefully you'll find Angelo behind the bar.